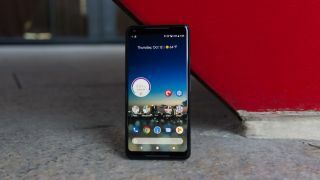 Google is set to issue a software update to the Pixel 2 XL to try and tackle the screen burn-in issues some users have reported on the new phone. An investigation into the screen tech has been underway since October 22 at Google HQ and the company has shared the results in a blog post, saying it still sticks by the screen technology used in the new phone. VP of Product Management Mario Queiroz said in the blog post, "Our investigation so far has given us confidence that our displays are as great as we hoped they would be, though we’re also taking steps to address the concerns we've heard." Those "steps" include an upcoming software update to tackle the issue of screen burn-in. It'll bring a new fade-out feature to the navigation bar that means it'll disappear after a short amount of time. Queiroz also said Google has found the display has similar decay characteristics to other phones on the market right now. That's not something anyone has seen on other phones though. What's currently uncertain is the issues we've heard of are screen burn-in or just image retention within the display. If it's the former, that's concerning that it has happened so quickly and is likely to only get worse. Whether this software update will be enough to stop the issues we've seen remains to be seen. There's also going to be a new mode for the Pixel 2 and Pixel 2 XL that offers more saturated colors too. Google wanted to "achieve a more natural and accurate rendition of colors" for both the phone's new screens, but the new software update will allow you to boost colors by 10% to give it a more vivid look if you prefer it to look like that. Google also doesn't confirm when it will be pushed to devices either. Right now it's just being tested in house, so if you already own a Google Pixel 2 XL it may be you'll suffer from the issue in the meantime. Another step toward tackling the issue involves Google's new 2-year warranty on all purchases of the Pixel 2 and Pixel 2 XL. It doesn't exactly inspire confidence in the software update that the company has seen fit to issue a warranty though. Google also hasn't confirmed whether this warranty will also cover screen burn-in issues too or if it's for other problems you have with the phone.